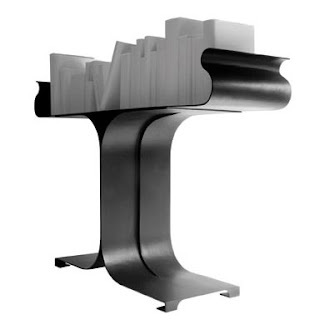 I'm not too familiar with John Reeves but wow this guy knows how to design a gorgeous console table. According to him the Omar is "reminiscent of an Arabic style, a tribute to the passion and creativity of Middle Eastern culture, while using materials and processes which are Western in technique, production and finish." That turns out to be an amazingly good idea, John. Thanks for coming up with it! Omar stands 31.5" high and is made from rolled sheet steel that comes in either a black or white powder coat. I would also like to say Gorgeous as its title !! That is a wonderful console table! wow..these seems to be a good design!